Before his death, King David had provided materials in great abundance for the building of the temple on the summit of Mount Moriah (1 Chronicles 22:14; 29:4; 2 Chronicles 3:1), where he had purchased a threshing floor from Araunah the Jebusite (2 Sam. 24:21 et seq. ), on which he offered sacrifice. The Bible states that in the beginning of his reign, King Solomon of the united Kingdom of Israel, set about giving effect to the ideas of his father, and prepared additional materials for the building. From subterranean quarries at Jerusalem he obtained huge blocks of stone for the foundations and walls of the temple. These stones were prepared for their places in the building under the eye of Tyrian master-builders.According to this account, Solomon also entered into a compact with Hiram I, king of Tyre, for the supply of whatever else was needed for the work, particularly timber from the forests of Lebanon, which was brought in great rafts by the sea to Joppa, whence it was dragged to Jerusalem (1 Kings 5). According to tradition, Solomon also provided for a sufficient water supply for the temple by hewing in the rocky hill vast cisterns, into which water was conveyed by channels from the "pools" near Bethlehem. One of these cisterns, the "great sea," was capable of containing three million gallons. The overflow was led off by a conduit to the Kidron. At length, in the Autumn of the eleventh year of his reign, seven and a half years after it had been begun, the temple was completed. For thirteen years there it stood, on the summit of Moriah, silent and unused. The reasons for this strange delay in its consecration are unknown. At the close of these thirteen years preparations for the dedication of the temple were made. 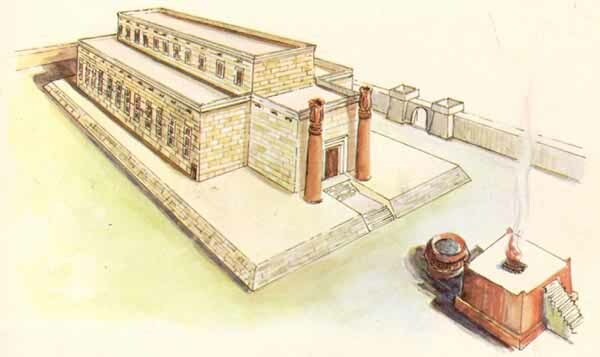 The Temple remained empty for only eleven months, until the month of Tishri in the year following its completion. Thus the Temple was dedicated at the autumnal new-year festival. According to biblical tradition, the Ark of the Covenant was solemnly brought from the tent in which David had deposited it to the place prepared for it in the temple. Then Solomon ascended a platform which had been erected for him, in the sight of all the people, and lifting up his hands to heaven poured out his heart to God in prayer (1 Kings 8; 2 Chr. 6, 7). The feast of dedication, which lasted seven days, followed by the feast of tabernacles, marked a new era in the history of Israel. On the eighth day of the feast of tabernacles, Solomon dismissed the vast assemblage of the people. 1. The Debir: the oracle or Most Holy Place (1 Kings 6:19; 8:6), called also the "inner house" (6:27), and the "Holy of Holies" (Heb. 9:3). It was 20 cubits in length, breadth, and height. The usual explanation for the discrepancy between its height and the 30-cubit height of the temple is that its floor was elevated, like the cella of other ancient temples. It was floored and wainscotted with cedar (1 Kings 6:16), and its walls and floor were overlaid with gold (6:20, 21, 30). It contained two cherubim of olive-wood, each 10 cubits high (1 Kings 6:16, 20, 21, 23-28) and each having outspread wings 10 cubits from tip to tip, so that, since they stood side by side, the wings touched the wall on either side and met in the center of the room. There was a two-leaved door between it and the holy place overlaid with gold (2 Chr. 4:22); also a veil of blue purple and crimson and fine linen (2 Chr. 3:14; compare Exodus 26:33). It had no windows (1 Kings 8:12). It was considered the dwelling-place of God. 3. The Ulam: the porch or entrance before the temple on the east (1 Kings 6:3; 2 Chr. 3:4; 9:7). This was 20 cubits long (corresponding to the width of the Temple) and 10 cubits deep (1 Kings 6:3). 2 Chr. 3:4 adds the curious statement (probably corrupted from the statement of the depth of the porch) that this porch was 120 cubits high, which would make it a regular tower. The description does not specify whether a wall separated it from the next chamber. In the porch stood the two pillars Jachin and Boaz (1 Kings 7:21; 2 Kings 11:14; 23:3), which were 18 cubits in height and surmounted by capitals of carved lilies, 5 cubits high. 4. The chambers, which were built about the temple on the southern, western, and northern sides (1 Kings 6:5-10). These formed a part of the building and were used for storage. They were probably one story high at first; two more may have been added late. 1. The court of the priests (2 Chr. 4:9), called the "inner court" (1 Kings 6:36), which was separated from the space beyond by a wall of three courses of hewn stone, surmounted by cedar beams (1 Kings 4:36). 2. The great court, which surrounded the whole temple (2 Chr. 4:9). Here the people assembled to worship God (Jeremiah 19:14; 26:2). According to 1 Kings 7:48 there stood before the Holy of Holies a golden altar of incense and a table for showbread. This table was of gold, as were also the five candlesticks on each side of it. The implements for the care of the candles - tongs, basins, snuffers, and fire-pans - were of gold; and so were the hinges of the doors. Two slightly different sites for the Temple have been proposed: one places the bronze altar on the rock which is now beneath the gilded dome, with the rest of the temple to the west; the Well of Souls was, in this theory, a pit for the remnants of the korbanot. The slope of the terrain in this area would require massive supporting structures for the Temple, what Easton's Bible Dictionary describes as "a huge wall of solid masonry of great height, in some places more than 200 ft (60 m) high. . .raised across the south of the hill, and a similar wall on the eastern side, and in the spaces between. . .many arches and pillars. . . ." The other places the Holy of Holies atop this rock, thus explaining its elevation. The traditions of this rock were sacred; probably the site was the same as that of the temple which Hadrian erected to Jupiter, which in turn was on the site of Herod's temple, which would naturally be on that of Solomon's�an example of the persistency of sacred sites in the East. The Temple has recognizable similarities to other temples of its time and region. Syro-Phoenician, Egyptian, and Mesopotamian influences are visible. A plaza or courtyard surrounding the sacred residence of the god, marked with stones, is a feature common throughout ancient Semitic religions. Earlier evidence of this practice among the Hebrews survives in the twelve stones that Joshua placed at Gilgal (Joshua 4:20) and the marking of Mount Sinai by Moses (Ex. 19:12), and in the forbidden zone surrounding the tent which was the predecessor of the Temple. Even today the Muslims designate certain areas, especially that surrounding Mecca, as inviolate haram. The Biblical text makes it clear that Solomon received aid from Hiram, King of Tyre, in the construction of his buildings. As the Hebrews were an agricultural people, this aid probably involved not only material (cedar-wood, etc. ), but architectural direction and skilled craftsmen. Its tripartite division is similar to that found in 13th century BCE temples at Alalakh in Syria and Hazor in the upper Galilee; a 9th century BCE temple at Tell Tayinat also follows this plan. Phoenician temples varied somewhat in form, but were similarly surrounded by courts. Among the details which were probably copied from Tyre were the two pillars Jachin and Boaz. Herodotus (ii. 44) says that the temple at Tyre contained two such, one of emerald and the other of fine gold. In the same way the ornamentation of palm trees and cherubim were probably derived from Tyre, for Ezekiel (28:13, 14) represents the King of Tyre, who was high priest also, as being in the "garden of God." Probably both at Tyre and at Jerusalem the cherubim and palm-tree ornaments were survivals of an earlier conception - that the abode of God was a "garden of Eden." The Tyrians, therefore, in their temple imitated to some extent the primitive garden, and Solomon borrowed these features.  Several temples in Mesopotamia, many in Egypt, and some of the Phoenicians are now known. In Babylonia the characteristic feature was a ziggurat, or terraced tower, evidently intended to imitate the mountains on which the gods resided. The chamber for the divine dwelling was at its top. The early Egyptian temples consisted of buildings containing two or three rooms, the innermost of which was the abode of the deity. A good example is the granite temple near the sphinx at Giza. The Middle Kingdom (12th dynasty) added obelisks and pylons, and the New Kingdom (18th dynasty) hypostyle halls. Solomon's Temple was not a copy of any of these, nor of the Phoenician buildings, but embodied features derived from all of them. It was on the summit of a hill, like the altar of Ba'al on Mount Carmel and the sanctuaries of Mount Hermon, and like the Babylonian idea of the divine abode. It was surrounded by courts, like the Phoenician temples and the splendid temple of Der al-Bakri at Thebes. Its general form reminds one of Egyptian sanctuaries and closely matches that of other temples in the region, as described above. The two pillars Jachin and Boaz had their parallel not only at Tyre but at Byblos, Paphos, and Telloh. In Egypt the obelisks expressed the same idea. The Jewish Encyclopedia stated that "All these were phallic emblems, being survivals of the primitive Hamito-Semitic 'mazzebah'", Jachin and Boaz were really isolated columns, as Schick has shown, and not, as some have supposed, a part of the ornamentation of the building. Their tops were crowned with ornamentation as if they were lamps; and W. R. Smith supposed (l.c. p. 488) that they may have been used as fire-altars. This assumes that they contained cressets for burning the fat.  Solomon or Shlomo in the Hebrew Bible (Old Testament), also called Jedidiah, was the third king of the united ancient Kingdom of Israel (there was no Kingdom of Judah in his time). Solomon was the builder of the first Temple in Jerusalem, also known as Solomon's Temple in Jerusalem. He was renowned for his great wisdom, wealth, and power, but also blamed for his later pacifism toward his converted wives in their worship of other gods. He is the subject of many later legends. He is also in a line of the greatest Kabbalah masters, legendary kabbalists. The name Solomon (Shlomo) means "peaceful," or "complete", from the Hebrew Shelomoh (Arabic Sulaiman). The name given by God to Solomon in the Bible is Jedidiah, meaning "loved by God", (2 Samuel 12:25), and some scholars have conjectured that Solomon is a "king name" taken either when he assumed the throne or upon his death.Solomon's case is one of the few in the Bible where the name given by God does not stay with the character. Solomon's birth is considered a grace from God, after the death of the previous child between David and Bathsheba. Solomon is David's second son by Bathsheba. In the Hebrew Bible, the prophet Nathan informs David that God has willed that his firstborn son must die, as punishment for David's method of execution of Uriah the Hittite, and his relationship with Bathsheba, Uriah's wife, which was fornication (although whether or not it was adulterous is disputed. After praying and fasting for a week, David heard the news that his son had died, and comforted the grieving Bathsheba, who became pregnant with Solomon. Solomon's history is recorded in 1 Kings 1�11 and 2 Chronicles 1�9. He succeeded his father (reigned circa 1011/1010 BC to 971/970 BC BC) on the throne in about 971 or 970 BC, not 1037 BC (1 Kings 6:1), following E. R. Thiele. His father chose him as his successor, passing over the claims of his elder sons, by women other than Bathsheba. His elevation to the throne took place before his father's death, and is hastened on mainly by Nathan and Bathsheba, in consequence of the rebellion of Adonijah.During his long reign of 40 years the Hebrew monarchy gained its highest splendour. This period has well been called the "Augustan Age" of the Jewish annals. In a single year he collected tribute amounting to 666 talents of gold, according to 1 Kings 10:13. In 1 Kings 3:5-14 there is written an account of an encounter between the newly crowned Solomon and the God of the Kingdom of Israel in which he offers Solomon anything he pleases. Solomon asks for "an understanding heart to judge thy people, that I may discern between good and bad: for who is able to judge this thy so great a people?" Pleased with his non-materialistic wish God tells him that not only will he recieve a foundation in epistemology greater than any other man, but also great wealth, power and prosperity. The idea that Solomon's Wisdom is God-given is very important to various Judeo-Christian beliefs. The biblical Book of Proverbs, written by Solomon, is a dogmatic guideline for morality and manners in many Jewish and Christian denominations. Some believe that Solomon also wrote the biblical book of Ecclesiastes in which there is an established sense of absurdity of man's feeble accomplishments. Here Solomon attacks the vanity of human actions and the importance of a relationship with God that many religions embrace. The Book of Proverbs is a book of the Tanakh/Old Testament. It is a collection of moral and philosophical maxims on a wide range of subjects presented in a poetic form. This book sets forth a philosophy of practical life, and is a compilation and adaptation of common sayings. It is clear that the author of the book gathered and recast many proverbs which sprang from human experience in preceding ages and were floating past him on the tide of time, and that he also elaborated many new ones from the material of his own experience. In particular, there is strong evidence that some of the proverbs were adapted from earlier Egyptian wisdom literature. And it is very possible that the book of Proverbs developed somewhat over time, with latter editors adding sayings as they went along. King Solomon's idea's are also essential to Christian Anarchism and Christian Pacifism. After the completion of the temple, Solomon erected many other buildings of importance in Jerusalem and in other parts of his kingdom. For the long space of thirteen years he was engaged in the erection of a royal palace on Ophel. Solomon also constructed great works for the purpose of securing a plentiful supply of water for the city, Millo (Septuagint, Acra) for the defence of the city, and Tadmor in the wilderness as a commercial depot as well as a military outpost. During his reign Israel enjoyed great commercial prosperity. Extensive traffic was carried on by land with Tyre and Egypt and Arabia, and by sea with Tarshish (Spain), Ophir and South India and the coasts of Africa. The royal magnificence and splendour of Solomon's court are unrivaled. Solomon was known for his wisdom and proverbs. People came from far and near "to hear the wisdom of Solomon", including queen Makedah or Bilqis of Sheba, (identified with a country in Arabia Felix). 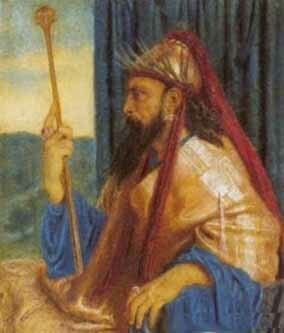 Their son Menelik I, according to Ethiopian tradition, would become the first emperor of Ethiopia. His thoughts are enshrined in storytelling, though probably, not all the clever thinking in the stories originates with the one man. In 1 Kings3:15-28 an account of Solomon's wisdom can be viewed as symbolic of the split in the Kingdom of Israel following the death of Solomon. In the story there are two new mothers, one of which who had smothered her baby during sleep and claimed the other woman's baby as her own. The problem is presented to King Solomon who proposes the baby be split in half, each woman receiving one half of the baby. The woman who was lying went along with the plan while the real mother immediately feels sympathy for her offspring and would rather see the other woman raise it than see it die. Solomon instantly grants the real mother the baby realizing that a true mother would compromise to see her offspring survive. This act, though not truly biblically significant it is a metaphor for what was about to happen to the Israelites and their nation. Surah 27:15 "And, indeed, We granted [true] knowledge unto David and Solomon [as well]; and both were wont to say: 'All praise is due to God, who has [thus] favored us above many of His believing servants!' And [in this insight] Solomon was [truly] David's heir; and he would say: 'O you people! We have been taught the speech of the birds, and have been given [in abundance] of all [good] things: this, behold, is indeed a manifest favor [from God]!'" Surah 34:12 "And unto Solomon [We made subservient] the wind: its morning course [covered the distance of] a month's journey, and its evening course, a month�s journey. And we caused a mountain of molten copper to flow at his behest; and [even] among the invisible beings there were some that had [been constrained] to labour for him by his Sustainer�s leave � and whichever of them deviated from Our command, him would We let taste suffering through a blazing flame �: they made for him whatever he wished of sanctuaries, and statues, and basins as [large as] great watering-troughs, and cauldrons firmly anchored." To Solomon are attributed by rabbinical tradition but not internally, the Biblical books of Book of Proverbs, Ecclesiastes and the Song of Solomon. Then comes the Wisdom of Solomon, probably written in the 2nd century BC where Solomon is portrayed as an astronomer. Other books of wisdom poetry attributed to Solomon are the "Odes of Solomon" and the "Psalms of Solomon". The Jewish historian Eupolemus, who wrote about 157 BC, included copies of apocryphal letters exchanged between Solomon and the kings of Egypt and Tyre. The Gnostic Apocalypse of Adam, which may date to the 1st or 2nd century, refers to a legend in which Solomon sends out an army of demons to seek a virgin who had fled from him, perhaps the earliest surviving mention of the later common tale that Solomon controlled demons and made them his slaves. This tradition of Solomon's control over demons appears fully elaborated in the early Christian work called the "Testament of Solomon" with its elaborate and grotesque demonology. The ancient Imperial legend of Ethiopia, as told in the Kebra Nagast maintains that the Queen of Sheba returned to her realm from her Biblical visit to Solomon, pregnant with his child, and giving birth to a son by the Mai Bella stream in the province of Hamasien, Eritrea. This child would eventually inherit her throne with the new rank and title of Menelik I, Emperor of Abyssinia. The dynasty he would establish would reign in Abyssinia with few interruptions until the overthrow of Emperor Haile Selassie in 1974. 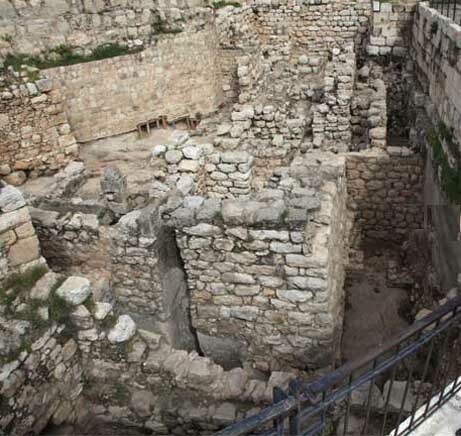 A section of an ancient city wall of Jerusalem from the tenth century B.C.E. (between 1000 BC and 901 BC), possibly built by King Solomon, has been revealed in archaeological excavations. 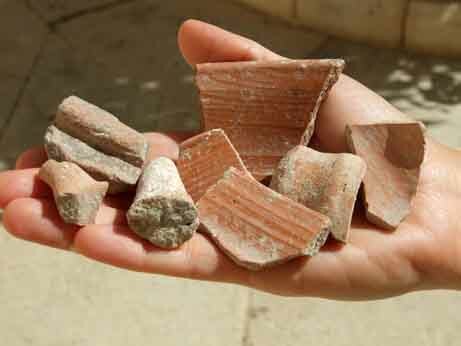 Muslim workers have unearthed artifacts on Jerusalem's Temple Mount, says an Israeli agency. The artifacts, which date to the First Jewish Temple period - the eighth to sixth centuries B.C. - were found by employees of the Waqf Muslim religious trust doing maintenance work, the Israel Antiquities Authority (IAA) reported. The artifacts may be the first physical evidence of human activity at the Temple Mount - also known as Solomon's Temple - in that time.